Hi everyone! For today I have another explosion mani to show you. It's such a fun design, so I'm still experimenting with it, using different colors and finishes. Here I used OPI's Absolutely Alice for the design, on top of Wet 'n Wild Blue Moon and with a matt topcoat afterwards. Normally I wouldn't pick a glitter as a layering color for tape manis, because they often need several coats to cover. But those of you who own a few OPI glitters, know how dense they can be, which is also the case with Absolutely Alice. I only used one coat of it and I'm still surprised by how crisp the design came out. Another benefit of this polish, being a glitter, is it doesn't 'bleed' when I go over it with my topcoat, like with some cremes. Nice! All the OPI glitters are stunning in my opinion, whether used alone or combined with other polishes. And apparently they're also perfect for tape manis ^^ So I'll definitely use them again for future tape adventures to add some magic to my nails... See you later! In case you'd like to create this look yourself, check out the tutorial for tips and tricks. 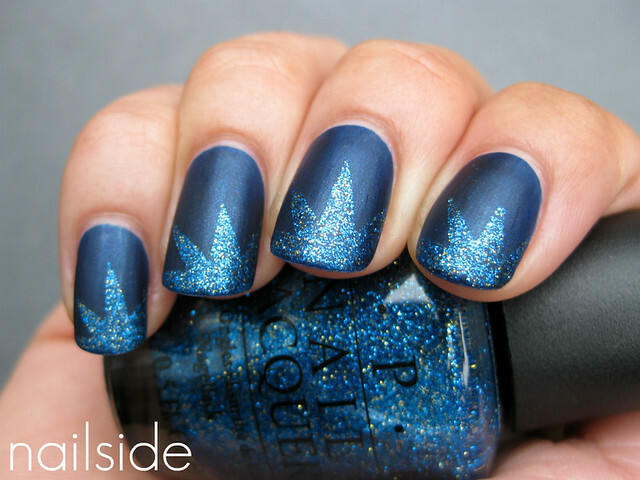 This is really cool-love the matte and the shiny together! That looks so awesome! I wish I had Absolutely Alice! 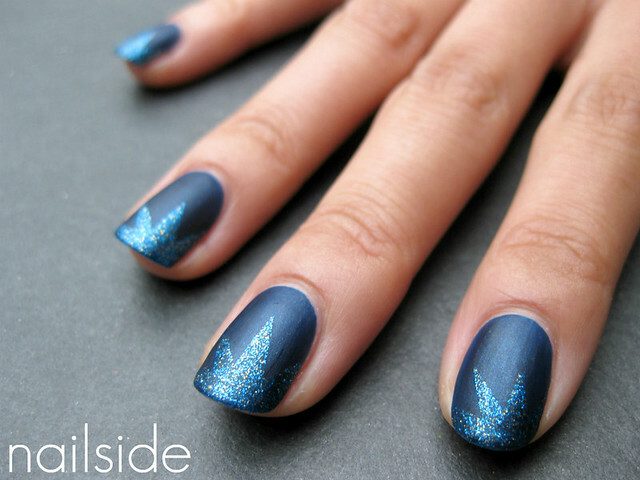 Love the contrast between the matte and glitter! Absolutely Alice is one of my favorite polishes for sure. wow! It looks super cool! Oooh, I like that! The glitter with the creme makes such a neat effect. Gorgeous! Definitely loving Absolutely Alice matte. This is so awesome! I love it. I have Absolutely Alice and if I were able to get my hands on Blue Moon, I'd be able to do this myself. It's so pretty. Ooh this has got to be my favorite one! Wow, despite the design and color it looks very "clean" and not loud at all, I think the matt effect makes it a "whole" if you know what I mean :). Love this! 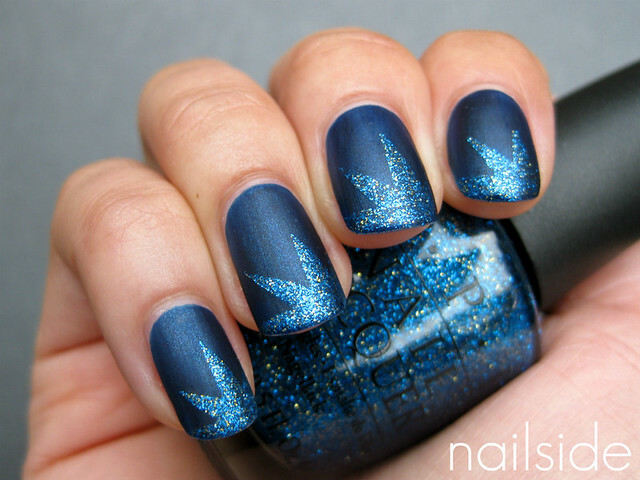 Another super cute nail design! This is my favorite polish combination you've done! I having AA on the way to me and now I am even more excited to receive it! Gorgeous. PS.. you have me addicted to mattifying everything!! I like the tonal a whole lot on this design. Thanks everybody for the sweet comments, I enjoyed reading every single one of them! Dit is echt weer een fantastische combi! Prachtig! Very very nice! I like this one the best out of all the explosion ones you've done.